We’ve been looking for great adventure getaways, so we were excited to see a discount for the Imperial River Company in Maupin, Oregon pop up on Groupon. 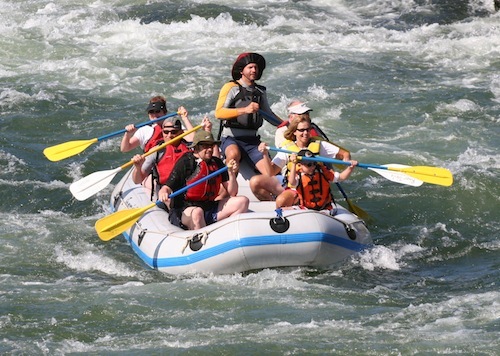 Over the summer Groupon has featured a number of enticing activities, and rafting down the Deschutes at half-off was way too good to pass up. Up at 6:30 am, we were on the road by 7 and in Maupin by 9:15am. The just over 2-hour trip on Highway 26 brings you up and over Mt. Hood and through the high desert near Maupin. It’s a nice drive and the fairly close proximity makes it possible to go down to the Deschutes River for rafting in the morning (check-in is at 9:30am) and make it back home in time for dinner. 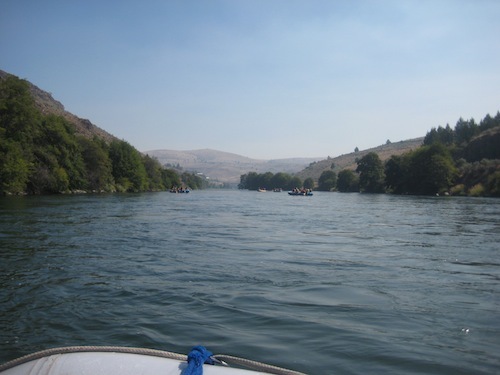 While the Groupon made a float down the Deschutes River a smoking-hot deal, the regular rates at Imperial River Company are extremely reasonable. The 18-mile all-day adventure, which runs 6 hours and includes lunch, runs $99 (or $80 for kids). Considering that they run rafts with only 6 people in each raft and you get your own personal guide, transportation from the river, and lunch, it’s a pretty great value for an entire day’s activity. The guides at Imperial River Company are exceptional. Our guide, Jason, has over 14 years of experience on the river and expertly guided our raft down the Deschutes. He seemed to know every nook and cranny of the river and exactly how to approach some of the more technical rapids for the best ride. The Descutes River is a really nice mix of wild class 3 rapids and stretches of much mellower class 1 and 2 rapids. The day we went rafting, stretches of the river were closed to boats due to fires, so we traversed the same section of river several times. It was a unique opportunity to ‘get to know’ a section of the river and see how different approaches give different rides on the rapids. I was surprised at just how wild some of the bigger rapids were, with some literally engulfing the boat with water. Some rapids featured dramatic drops which rivaled many of the great roller coasters I’ve ridden. 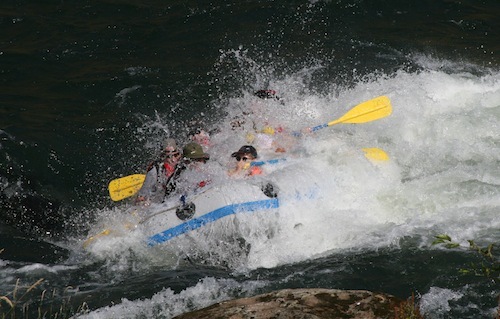 Because of the intensity of some of these rapids, Imperial River Company requires that riders be at least 6 years old and at least 50 pounds. I brought my son down the river, who is 9 and a solid swimmer. 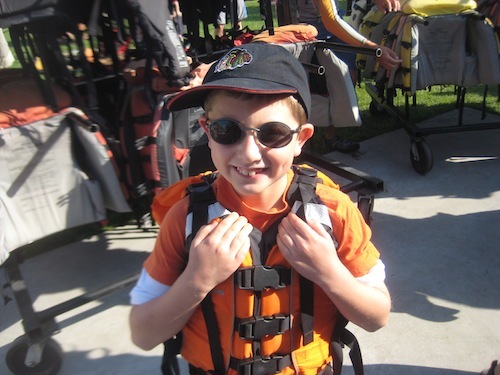 It felt like a good age to introduce him to the wonderful world of whitewater river rafting. None of the people in our boat had what they call an “out-of-raft experience” but we saw a couple of other riders fall out throughout the course of the day. I was very impressed by Imperial’s quick and coordinated efforts to get these riders out of the river and back onto the boats. We felt completely safe and in great hands the entire trip. The trip down the Deschutes isn’t all white-knuckle rapids. There are some great stretches of river where we were able to calmly float and take in the scenery and wildlife. Also, mid-day we took a nice break for lunch at the rafting company’s headquarters. They have their own landing which makes stopping for lunch a snap. Imperial River Company is located right near amazing ranchers like Painted Hills, and they serve fantastic local, grass-fed, pasture raised beef in their burgers. There’s a summer camp-like atmosphere during the float down the Deschutes River – guides tell jokes and everyone seems to be having a good time. There are parts of the day filled with great heart pumping excitement and parts where you can just sit back and enjoy floating down the river. It’s the kind of contagious fun that makes a single day of river rafting feel like a long adventure. 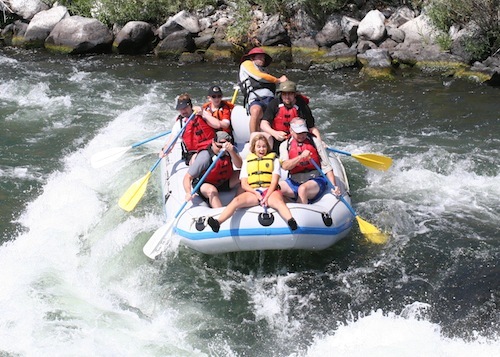 We were extremely happy with our Imperial River Company rafting experience and absolutely plan to make a float down the Deschutes River an annual adventure with them. Imperial River Company has a fantastic “No Rain Guarantee”: if you get rained on during your rafting trip, they give you another trip for free. They also have accommodations on-site for people who want to stay over the night before or after a rafting trip. They contract with a professional photographer to provide pictures from the trip, for which they charge $12.95 per 5×7 print or $60 for an entire photo CD. The CD we bought contained 73 photos and we were very pleased with the quality of them. As mentioned before, a full day trip runs $99, but it’s important to also factor in a tip for the guide, which should be around $15-$20 per person in your party. Also be sure to bring a change of clothes as you WILL get drenched. Imperial River Company is located at 304 Bakeoven Road, Maupin, OR 97037. Phone (800) 395-3903.